Hello, bloggers, it’s been awhile. I hope you all are enjoying your summer. In the short period of time that I have been on WordPress, I have found a home where I can talk from my heart and not be judged. At the end of the day, we are just human, surrounded by land and water. It’s such an honor to be nominated for the Family Award. If you know my story, you can imagine that for me to be a part of anything that has to do with “family” is extra special and rewarding. Thank you for all of your comments and hugs! They are most appreciated and needed. 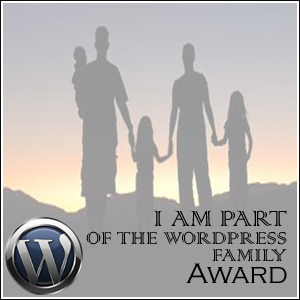 http://rbclark.wordpress.com/2013/07/23/wordpress-family-award/ for the award. I am grateful. You rock, brother! 2 Link back to the person who nominated you.